An updated version of the UCS Satellite Database is now posted. The new version includes launches through August 31, 2011. The database is freely available and can be downloaded in various formats. 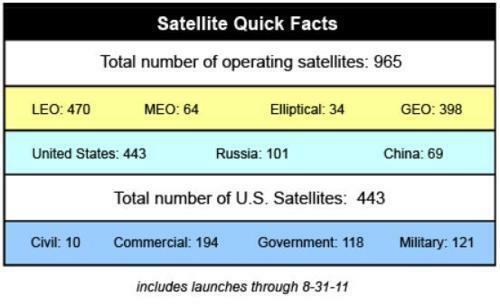 The total number of active satellites is holding steady at 965; although 35 satellites were launched this last quarter, we were able to confirm that a large number of Globalstar satellites are on their way or are already in disposal orbits.